Climate change is impacting life around the world and in Texas, and its effects will become increasingly obvious as the century progresses, former Vice President Al Gore told a capacity crowd at Rice’s Tudor Fieldhouse Monday. Gore incorporated state-specific stats into a 75-minute presentation replete with images of melting roads, collapsing glaciers, flooded cities and other dramatic weather events scientists have linked to climate change. The event with Gore, who is chairman of the Climate Reality Project and a board member of Rice’s Doerr Institute for New Leaders, was presented by the Doerr Institute and the university’s Office of the President. Gore was introduced by Provost Marie Lynn Miranda, who said, “This is the first opportunity we’ve had to have a major event here on campus since Hurricane/Tropical Storm Harvey came to visit us in Houston, and I want to say to all of you how very glad we are to see you here. That storm was referenced repeatedly during Gore’s presentation, which drew on parts of his new documentary, “An Inconvenient Sequel: Truth to Power,” this year’s follow-up to his 2006 award-winning documentary, “An Inconvenient Truth.” Gore updated his presentation with imagery and commentary taken from the hurricane season, with a special focus on Harvey and Houston. Citing worsening fire seasons in the western United States and intensifying hurricanes in the Southeast, Gore noted that the past three consecutive years have ranked as the hottest on record. Much of the heat trapped in the atmosphere makes its way into the oceans, Gore said. Cool water in the Gulf of Mexico that had weakened hurricanes approaching the U.S. has warmed, which makes stronger storms more likely, he said. Gore met with a group of Rice students and faculty prior to his public presentation. Hurricane Harvey crossed waters that were 7 degrees warmer than normal up to 200 meters (about 656 feet) beneath the surface, Gore said. The warmer water helped Harvey quickly morph from a tropical storm to a hurricane and drop a record-setting 60 inches of rain in parts of Texas. In fact, Harvey dumped as much water on the U.S. as would have been released by more than 500 days of the full flow of Niagara Falls, said Gore, who applauded heroic rescues in Texas. Gore connected the extreme weather of Harvey with extreme weather around the world: flooding in Miami, Havana and San Juan, Puerto Rico, as well as China, Bangladesh and Nigeria. In Texas, six cities have set all-time-high temperature records this year, while in the Middle East, Bandar Mahshahr, Iran, last year reported 165 degrees. He connected these weather developments with a likely massive migration crisis, as parts of the world become increasingly uninhabitable, and warned of the consequences for global politics today and in the future. “We are leaving the boundaries of the climate balance that we have known since human civilization began,” said Gore, who spends the majority of his time with the Climate Reality Project, a nonprofit devoted to solving the climate crisis. 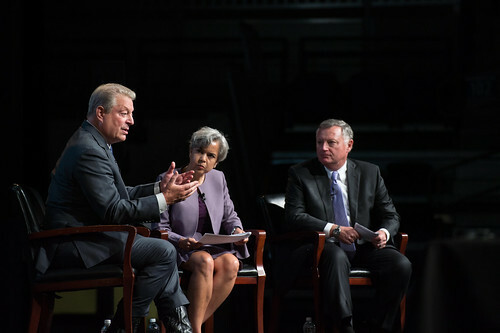 Gore, co-recipient, with the Intergovernmental Panel on Climate Change, of the 2007 Nobel Peace Prize, shared some positive data along with the concerning projections. Solar and wind energy are growing much more quickly than expected around the world and in Texas, he said. Rice Provost Marie Lynn Miranda, center, and Doerr Institute Director Tom Kolditz moderated a question-and-answer session with Gore following his presentation. U.S. cities are committing to relying 100 percent on renewable energy. Earlier in the day, Gore had visited Georgetown, Texas, which he identified as the first and only city in the state to operate solely on renewable energy. A number of countries also are pushing toward all-electric vehicles in the coming years, he said. Gore, who avoided political finger-pointing in his speech, said he finds it especially encouraging that climate change is becoming less of a partisan issue. After the presentation, Miranda moderated a question-and-answer session along with Doerr Institute Director Tom Kolditz. To view a Rice News video with highlights from the event, go to http://www.youtube.com/watch?v=wmxVadESKXg.